Alt-rap veterans Doseone and Mestizo combine for A7PHA's debut record, an experimental album that will challenge and bemuse many listeners but remains deeply original and technically fantastic. 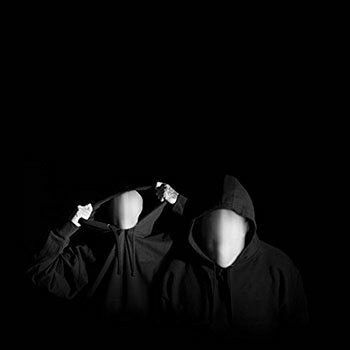 Signed to independent hip-hop powerhouse, Anticon, A7PHA is the coming together of two veterans of the alternative rap scene, Anticon co-founder Doseone and underground rapper Mestizo. Their left field, self-titled debut comes as a stark reminder of how the boundaries of rap continue to be challenged as it becomes ever more ingrained in popular culture. The group formed after collaborating on Mestizo track “Turning Tables” and the pair have both reflected on how natural and organic the union instantly felt to them, inspiring and challenging each other, and the album developed from there. While “Turning Tables” was a great slice of underground hip-hop, with hindsight it provided a mere precursor to what was to follow on their debut. The duo’s jarring lead single “No Brakes” opens the album with a similar level of dazzling wordplay, vivid storytelling and the intoxicating vocal performances to that seen on “Turning Tables” and dark, metallic production perfectly complements them. What follows across the next nine tracks is a mix of posturing, personal reflection, and exploration of social experiences. Highpoint “Closer” implores “All I want is one acre that is utterly government free, that beautiful thing that can only be destroyed by me” as the pair reflects on their desire to escape somewhere, find inner peace and space to enjoy with family and friends. A7PHA was recorded during some tumultuous times for both artists. Mestizo saw family and friends locked up, passing away and suffering illness alongside the birth of his second son and Doseone believes the challenges of real life were granulated into the recording, with the violence that pervades their lives influencing tracks such as “Closer”. There are also reflections on their past in the hip-hop industry, as they reflect “I ain’t never been trendy” in their pursuit of the music they truly believe it. A7PHA is a testament to this; an original album packed with technical dexterity and creative ideas. Production on the album is handled almost exclusively by Alias, who provides the perfect soundscape to match the duo’s delivery. It is dark, heavy and intense, with snapping drums breaking through effects, synths, thick basslines and reverb. The drums seem almost secondary throughout, unusual in hip-hop, with traits of post-punk identity fusing with a backpacking mentality. The most classic hip-hop production of the album comes on “Hater Hate It”, which draws a comparison with Run the Jewels, and Doseone and Mestizo prove equally comfortable collaborators. Both duos have distinctive characters and voices and have long established careers, revered in their own spaces. The album also feels like a successor to the Company Flow and Def Jux records of the late '90s underground that pushed hip-hop in exciting new directions while it became more and more entrenched in mainstream culture. However, what differentiates Killer Mike and El-P from A7PHA is their pop sensibilities. As a duo, A7PHA do not make the same immediate impact, and while Killer Mike and EL-P never tend to the mainstream, Doseone and Mestizo almost reject it purposefully. Their lyrics are less immediate, their vocals less palatable and their sound more challenging. Doseone in particular sounds almost otherworldly throughout, his versatile flow moving from hyperventilated flow to sing-song delivery, exploring a range of pitches, tempos and distortive effects throughout. Mestizo is not to be outdone and shows his own range on tracks such as “Modern Animal”, going double-time, and both prove their technical credentials as true purveyors of the art of rap throughout. By the end, A7PHA may be slightly too leftfield for many, particularly for casual hip-hop fans. Not all of the tracks hit the mark, and it can be a little difficult to infer a clear identity throughout the course of the record. However, the duo continues to push boundaries and have produced a record that will have few comparators come year end. Its eccentricities are what makes it so distinctive and interesting, a record packed with ideas, strong messaging and dense, cohesive production. However, it is also those traits which hold A7PHA back from making a bigger impact, especially in engaging a wider audience as it remains the work of artists on the fringes of hip-hop, who have been there so long and seem so comfortable there, with the freedoms for exploration it brings.